The fields and woodlands around the small Scotland County town of Wagram, nine miles north of Laurinburg on U.S. Highway 401, haven’t changed much since John Charles McNeill (1874-1907) roamed them as a sunburnt boy more than a hundred years ago, storing up the natural lore and imagery that would later inspire his poetry. McNeill died at an early age, but during his brief life he established himself as the foremost literary figure of the state and was hailed for many years by popular acclaim as North Carolina’s unofficial poet laureate. 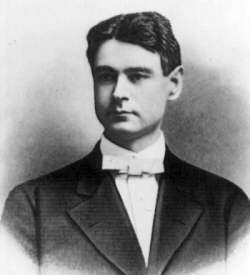 Before entering Wake Forest College in 1894, he studied at Whiteville Academy, clerked in a store, and taught in Georgia. At Wake Forest, McNeill was an exemplary student, contributing poems to and editing the literary journal, while taking special law courses. He was briefly on the faculties at Wake Forest and Mercer University. At the age of twenty-six, he opened a law office in Lumberton and bought an interest in the Argus, a weekly newspaper to which he contributed stories and poems, but after several years he moved his practice to Laurinburg, where he was elected for a term to the state legislature. In 1901 the popular national magazine Youth’s Companion accepted one of his poems, and the prestigious Century Magazine, over a four-year period, printed eighteen more. But it was Charlotte Observer editor Joseph P. Caldwell who allowed McNeill to follow his calling by hiring him in 1904 to write “whenever and whatever he pleases.” In the “Mule Pen,” as the Observer newsroom was called, he was known affectionately as “Mac,” and his frequent newspaper columns over the next three years, which ran under a dozen titles, including “A Jug of All Sorts,” “Songs Merry and Sad,” and “Banjo and Mandolin,” carried some 467 of his poems. He also wrote anecdotes, fables, reports on fires and funerals, book reviews, and covered special events in North and South Carolina. His byline became regionally famous. In 1905, John Charles McNeill became the first winner of the Patterson Cup for literary excellence in North Carolina, his entry a manuscript of poems later published as Songs Merry and Sad. His death at the age of thirty-three at his family home in Riverton brought sorrow to his fellow North Carolinians in a way usually reserved for the passing of a beloved statesman. A year later, another collection of his verse, Lyrics from Cotton Land, was published, assuring his reputation. McNeill had considered calling this volume Possums and Persimmons, and a new collection by that title appeared in 1977, edited by Richard Walser. It’s a tribute to his enduring appeal that The Pocket John Charles McNeill (St. Andrews Press, 1990) sold out. He is buried at the old Spring Hill Cemetery in Scotland County, and his birthplace near Wagram has been restored. View photographs and visit the John Charles McNeil house in Wagram, NC.